I'm not ashamed to admit that I choose books by their covers and audiobooks by their readers. David McCullough has a soft, soothing, grandpa-like voice that makes listening to nonfiction pleasant and relaxing. And that, my friends, was why I picked up (or downloaded) this particular title. Back in college I had a professor who said that history is the story of people within a particular context and time period. It's not dates and events that must be memorized, but individual stories that explain the who, what, when, where and whys. McCullough seems to embrace that same philosophy. The Wright brothers and their contribution to aeronautics is really just a story. It's a story of two men with a self-drive and determination that epitomizes the "American dream". And that's where this story is interesting. Here are two men without any formal education or training in aeronautics who took the world by storm. They did it through hard, hard work and persistence. Failures were seen as opportunities, and there were no obstacles that some heavy reading and experimenting couldn't solve. They were observers and discussers and explorers. And they were brave. Despite crashes and close calls, they got back into the air every time, proving that heavier-than-air flight was possible. McCullough also paints a picture of two genuinely thoughtful, kind, unpretentious men. 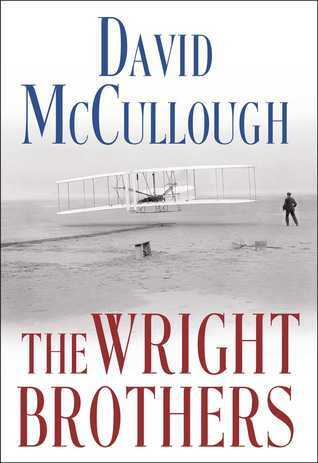 Despite the prestige and attention they eventually received first in Europe and then in the states, the Wrights brothers, and their sister Catherine, remained humble and grateful. They were secretive to protect their work, but they appreciated the excitement that their achievements stirred into the hearts of the thousands that came out to see them fly. I have a feeling their will be more David McCullough in my reading future. It's accessible history that is both entertaining and informative. And one day I'll have to make another trip out to Kitty Hawk to fully appreciate what these men accomplished. Who's up for a road trip? !